Six dioramas present key moments of the eighty-one-day imprisonment of the worlld’s most famous artist. Photo by the author with permission from the Venice Biennale. Art world movers and shakers have been busy for the last few weeks. New York hedge fund billionaires and Russian oligarchs, with their private jets and monster yachts, traveled between Art Basel Hong Kong and Christie’s in New York, where a half-billion dollars worth of art was sold on one night. Then many of them moved on to the Venice Biennale, which opened at the end of May. The title of the piece, S.A.C.R.E.D., is an acronym referring to the six moments portrayed in the dioramas: Supper, Accusers, Cleansing, Ritual, Entropy, Doubt. Only in Venice at the Biennale would this work be set in such a spectacular space: inside the deconsecrated church of Sant’ Antonin, built in the 1660s, with Baroque side chapels and paintings of saints—in the middle of which the six large black metal boxes look especially mysterious and menacing. The second of the two pieces is Ai’s response to the 2008 Sichuan earthquake, when more than 5,000 children were killed in schools deep in rural China, a thousand miles from Beijing, schools that collapsed because of shoddy construction permitted by corrupt officials. 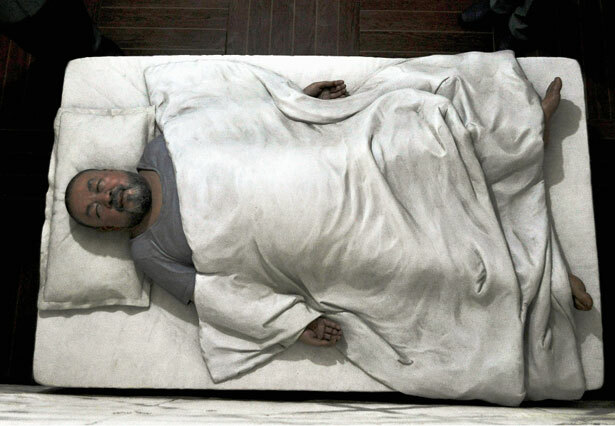 After the government refused to release the names of the dead, Ai Weiwei formed a citizens’ commission, volunteers, including parents, who investigated the disaster and published their findings, including the names of the dead children and details about the corruption. The government, meanwhile, removed the faulty steel rebar from ruins of the collapsed schools and sold it for recycling. And Ai Weiwei bought it—150 tons of it, twisted evidence of the corruption and the cover-up. He then organized a shop where the steel bars were straightened. These were the events that made Ai Weiwei the world’s most important political artist, and it was at this point that Ai Weiwei was imprisoned. But when he was finally released eighty-one days later, he found that the work of straightening the rebar had continued. The piece on exhibit in Venice displays 150 tons of rebar recovered from the ruined schools—different lengths and diameters, now rusted and pounded and piled on the floor. Ai Weiwei’s fifteen-minute video tells the story from the beginning—how he went to Sichuan and videotaped the graves of dead children, the demolition of the schools, the sorting of the rebar, and then he shows a dozen workers pounding and straightening the steel. The piece has been shown in the US, as part of a career retrospective at the Hirshhorn in Washington, DC, in 2012, and then the Brooklyn Museum. At the Hirshhorn the rebar appeared along with a wall-size spreadsheet listing the names of 5,196 children killed in the Sichuan quake, along with their birthdays and schools. Visitors also heard a recording in which he read the names. While Straight was on exhibit in Brooklyn, Mary Boone Gallery in Manhattan displayed a second collection of the rebar, with twisted pieces laid out on the floor in a pattern that evoked a Jackson Pollack painting. The video in Venice shows the assembly of the Mary Boone piece and its finished form. To learn more about Ai Weiwei, watch Alison Klayman’s terrific documentary “Ai Weiwei: Never Sorry”, and visit Wei’s website, aiweiwei.com.